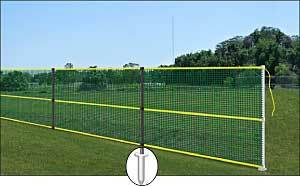 Perfect home run fence solution for portable outfield fencing Fast & Easy. This unique New fence product provides the economy of Polypropylene Mesh fence material enhanced with bright Yellow banding at the top, midpoint and bottom of the 48" stock. Whether its being used as an Outfield Fence on a Ball field or simply a Crowd Control device, MarkSmart™ Fence provides an added margin of safety for players, spectators or the general public. Now featuring 5 reinforced support poles in every set to better stabilize the fence in windy or storm conditions. MarkSmart Fence, combined with Markers Inc. patented SmartPole™ installation system provides the quick, easy installation and teardown you'd expect for a temporary or seasonal fence application. The Deluxe System features a permanently installed Ground Socket to accommodate SmartPoles™ for recurring or seasonal needs. Thanks for your help. Fence looks great. See for yourself.